Conwy Feast is my most favourite food festival. Official. I admit I am somewhat biased. 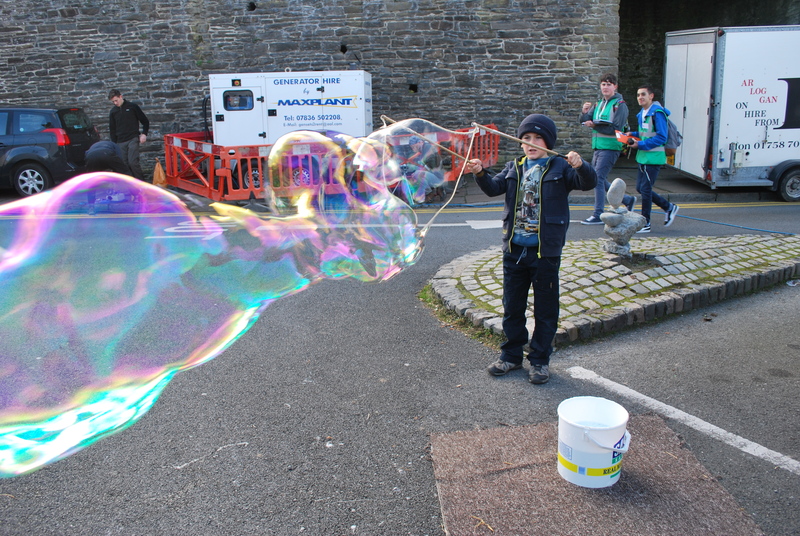 Conwy Feast has a lot going for it. 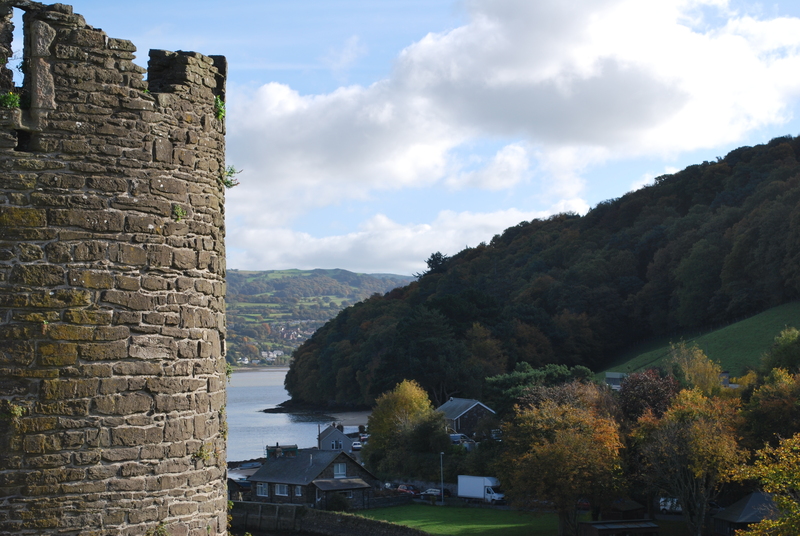 It’s set in the most stunning surroundings, within the walls of Conwy Castle and overlooking the Conwy Estuary, and is right on my doorstep. This of course makes it even more personal because a lot of my friends attend, as do many of my regular supper club / food suppliers. I can’t move but end up in conversation and I love that! What makes it even better is the superb variety of local music, performance and entertainment from folk to reggae, latin, capoeira and giant bubbles (yes, lots of friends again…Bandabacana and Tacsi were my two must-see bands this weekend) to enthrall between the tasting and drinking and then just as it starts to get dark and you think it’snearly all over comes the grand finale; Blinc digital arts festival which uses buildings and spaces around the old town as a massive art installation. 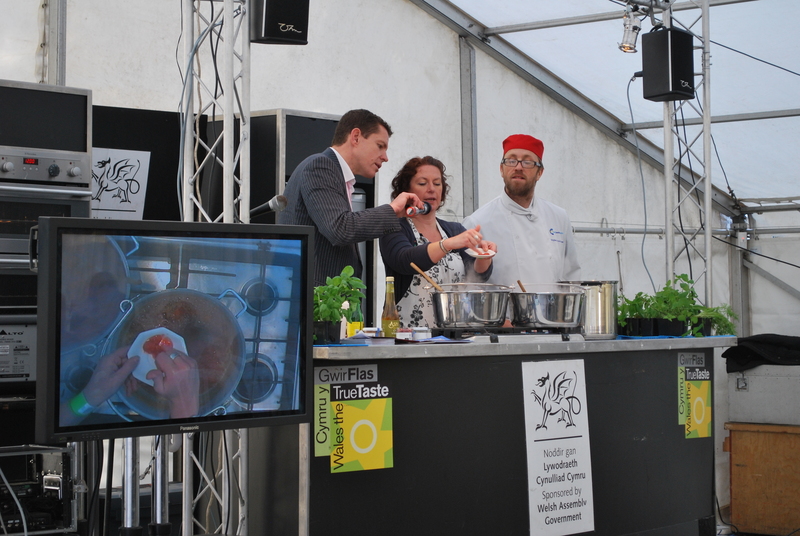 Conwy Feast is the second largest food festival in Wales (the biggest in North Wales) and attracts the likes of Bryn Williams of Odettes, Hywel Jones of Lucknam Park and this year Laura Coxeter, vegan and raw food chef from Coxeters Fayre, who cooked along with several well-known local chefs; Jimmy Williams, Elwen Roberts, Angela Dwyer & Ian Watson…plus Gareth Jones, Great British Menu finalist and me! 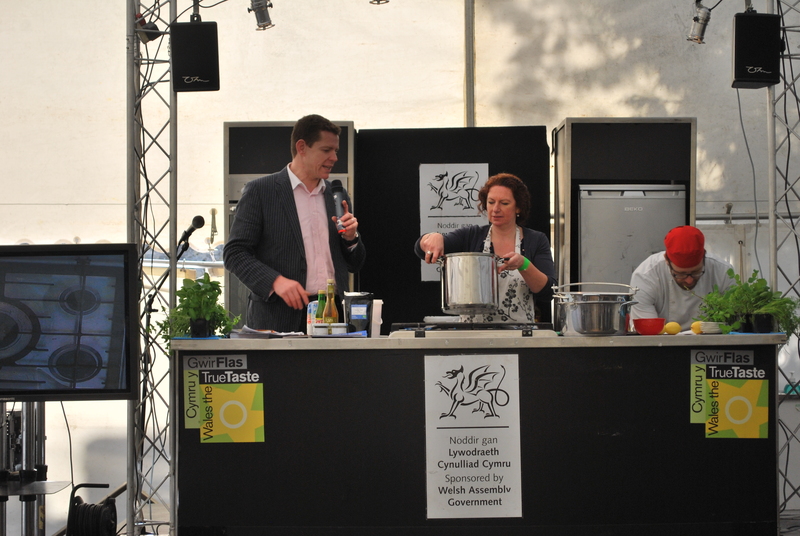 With this year’s focus on seasonal foods, vegan cookery and local produce I suggested a preserving master class. I’ve run a few designed for beginners and the more advanced, but I wanted to make this one a bit different. 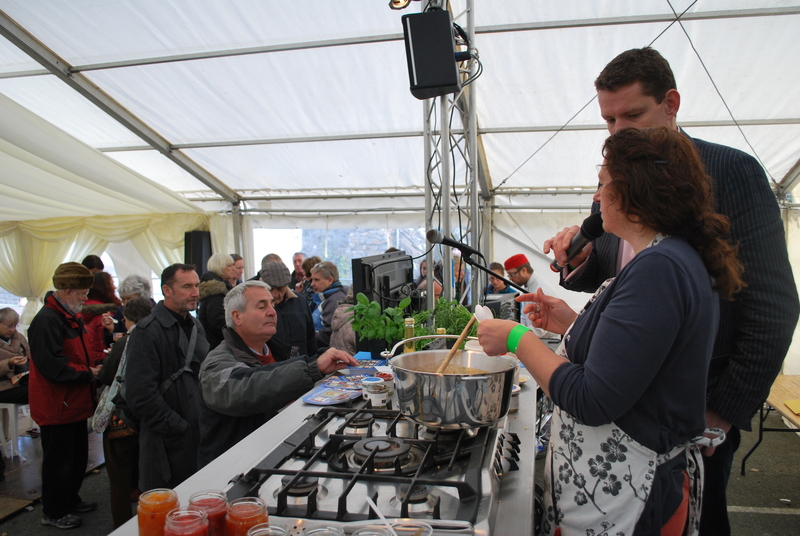 For this demo I introduced a variety of more unusual spices kindly provided by the wonderful Steenbergs, UK specialists in organic and fair trade products. I love them and they certainly know their stuff not skimping on quality or beautiful packaging! 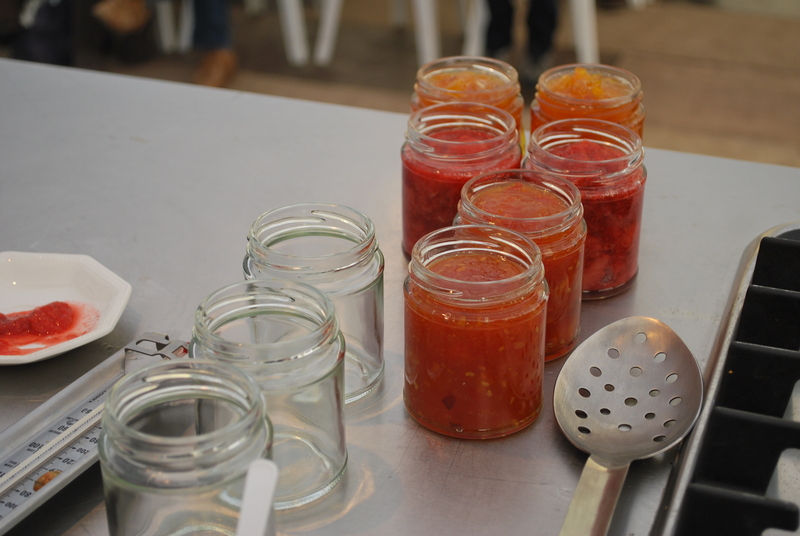 I used chilli flakes, mace, star anise, ginger, pink pepper corns and yellow mustard seeds to enhance the flavour of my tomato chillijam and pumpkin marmalade and a sneaky vanilla pod (plus apple pectin) to pep-up my sugar-free strawberry jam. I wasn’t sure if the latter was brave or foolhardy as I’d never gone completely sugar-free before, but I thought it was a good opportunity to test it out to see if it would work. In front of a live audience!! “did you put the cider vinegar in the tomato jam?” to which I turned pale as I realised I hadn’t. Oh well, I’m only human and there was an awful lot to concentrate on. Everyone seemed to like it even without the cider vinegar, although in contrast to the strawberry this one was a bit sweet!! Put all the ingredients into a large pan. Warm gently over a medium heat until it begins to bubble, then turn up the heat so it bubbles a little more fiercely. Stir occasionally until it begins to thicken. Don’t let it stick on the bottom. Test for a set by dropping a teaspoonful on a cold saucer. If it sticks and doesn’t run off it it’s set enough to jar. ** This jam is more volatile than one containing sugar so should be stored in the fridge. It’s more like a compote than a jam really, so you can eat it with toast or stirred into yogurt. If you find it a little too tart and you want to sweeten it with something, perhaps add a dessertspoonful of Agave nectar as I did when I made it again at home. It cuts through the sharpness just enough and has a lower GI than refined sugar making it a better alternative for those avoiding it. Warm the tomatoes, ginger, chillies, garlic and spices in a wide preserving pan with the sugar and vinegar, stirring until the sugar has dissolved. Simmer over a medium heat so it bubbles quite briskly, stirring regularly, for about 20 minutes or until the jam has thickened. Pour into sterilised jars and store. All photographs copyright Kate W photography. Kate is a London based freelance photographer and is available for commissions. Her photographs have been published in The Stage and The Voice magazines. Awesome. Those things and pictures makes me so thrilled to have a stay at conwy cottages. There are great things.. fun stuff to enjoy with kids.